Calligraphy contributed to the development of the modern day writing style. Today, calligraphy is commonly used for adding artistic touches to book/logo designs, signs, etc., as well as for many practical purposes such as writing certificates, wedding cards, for religious purposes, or simply as a form of art. The ultimate calligraphy set for the dedicated calligrapher of any level! Whether you are following the step by step instructions included or mastering your own calligraphy style, free your mind and your hand! This 33 piece deluxe pen set includes 4 calligraphy pens in assorted colors, 5 calligraphy nibs (extra fine, fine, medium, broad, extra broad), 20 water based dye ink cartridges (5 blue, 5 black, 2 brown, 2 pink, 2 green, 2 orange, 2 yellow), 1 metal pump (converter) for use with bottled ink, an easy to follow instruction book, a practice paper pad, and a portable metal storage tin to carry and store your set! 3 easy steps to filling your pen: Step 1: To insert your ink cartridge, gently unscrew the black nib of the calligraphy pen and put the cartridge (smaller opening end first) into the opening. Step 2: Hold the inserted ink cartridge against a strong surface, such as a table top, and press down firmly on the pen to force the cartridge to click into place. You will hear a click when the back of the pen nib pierces the cartridge. Step 3: Screw the nib back onto the pen and place the calligraphy pen upright for a period of around one minute, prior to use. Then gently press it onto a scrap piece of paper to start the ink flow – it should only take a couple of strokes for the ink to start flowing. You’re now ready to start writing! Interchangeable nibs in Extra Fine, Fine, Medium, Broad, Extra Broad, can be used with any of the 4 fountain pen bodies included! 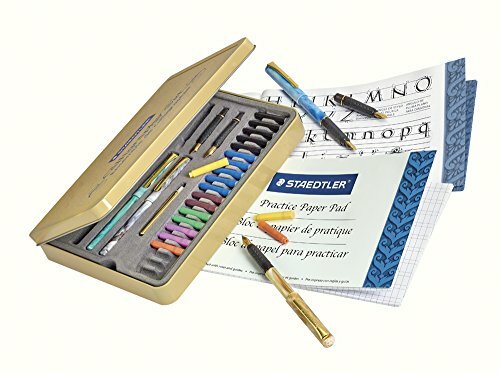 The handy instruction and exercise booklets included with this set offers a letter-by-letter introduction to the art of calligraphic writing as well as a lot of handy tips.